The Little Tikes Giant Slide Bouncer is a big step in fun fitness! This bouncer has it all! Climb, slide, crawl and of course bounce in this compact design that features our tallest slide ever! Hours and hours of physical play await your little ones! Includes a patch kit and bag for storage. 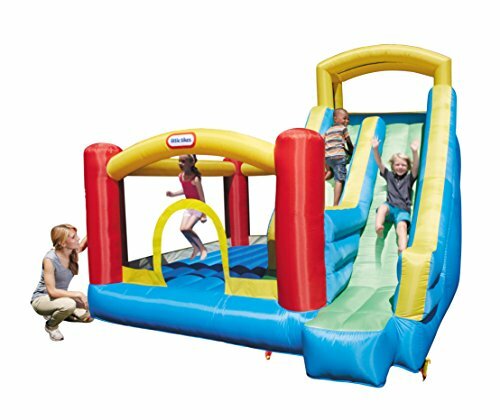 Huge slide measures over 9" tall -- the biggest slide we offer! This bouncer has it all -- a large climbing wall, giant slide and a large protected bouncing area! Huge slide measures over 9 feet tall. High walls & mesh side panels provide protection. Includes a storage bag, heavy duty blower with GFCI plug, repair kit and stakes for anchoring. Bouncer measures 10'W x 10'L x 9'H and recommended for ages 3+ years.